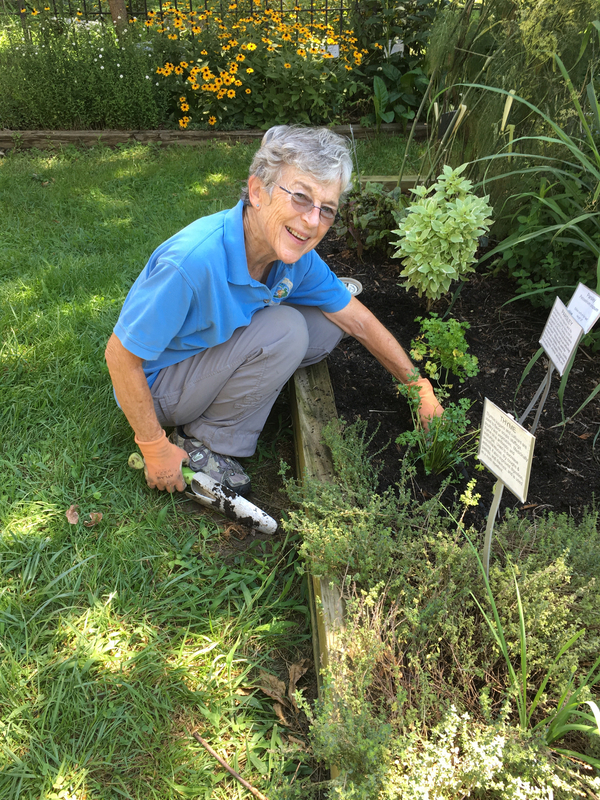 Master Gardeners of Northern Virginia (MGNV) is an organization of volunteers who work with the staff of Virginia Cooperative Extension (VCE) to encourage and promote environmentally sound gardening practices. MGNV members must complete over 60 hours of combined classroom and in the field training, as well as 60 hours of volunteer work as interns to become certified by Virginia Tech as VCE Master Gardeners. Additional volunteer work and continuing education are required each year to maintain certification. clinics in farmers’ markets and a public library as well as at special events. We field a wide range of gardening questions through the VCE Horticultural Help Desk at the Arlington County VCE office. We conduct public workshops in such areas as container gardening, composting, and lawn care. We support horticulture therapy and schoolyard gardening projects, and we respond to other community needs as they arise. Master Gardener Judy Funderburk at the Glencarlyn Library Community Garden. The idea for a Master Gardener program originated in Washington State more than 40 years ago. The idea took root in the Washington DC area in 1978 and officially grew into Arlington/Alexandria in the early eighties, back then, it was known as the Metro Master Gardener Program. From the beginning, Master Gardener volunteers staffed a horticultural help line and plants clinics. Master Gardeners managed the newly established Farmers Market in Arlington. Back in those days, MGs also maintained a vegetable garden. It was located at the National Zoo and it provided fresh, pesticide-free vegetables to the animals. Master Gardeners from Arlington and Alexandria met in 1983 to form an association that would support the work of the Extension Master Gardener program and foster fellowship among Master Gardeners and provide continuing education. Master Gardeners of Northern Virginia was incorporated and registered with the State of Virginia in 1985 and received confirmation from the IRS of its 501(c) (3) status in 1990. In 2017, MGNV has 223 members, 158 of whom are active Master Gardeners, 27 are interns and the rest are our Emeritus members and Affiliates. Our volunteers have become a central part of VCE’s efforts to provide residents of Arlington County and the City of Alexandria with up-to-date, reliable, researched based information about gardening practices that protect the environment and promote sustainability. For more information, please feel free to contact us with the information provided on our Contact Us page.